Gov. 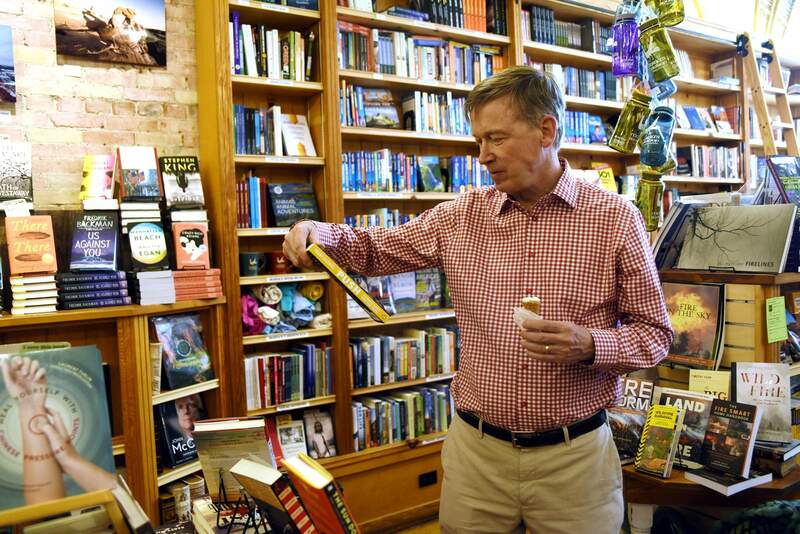 John Hickenlooper shops at Maria’s Bookshop during a visit Friday to downtown Durango. Hickenlooper joined Sens. Michael Bennet and Cory Gardner and Rep. Scott Tipton in a meeting with local leaders to discuss the economic impact of the 416 Fire. Sen. Cory Gardner, left, and Rep. Scott Tipton chat with local residents during a visit to Durango on Friday to meet with Durango and Silverton business owners and officials about the economic impact of the 416 Fire. 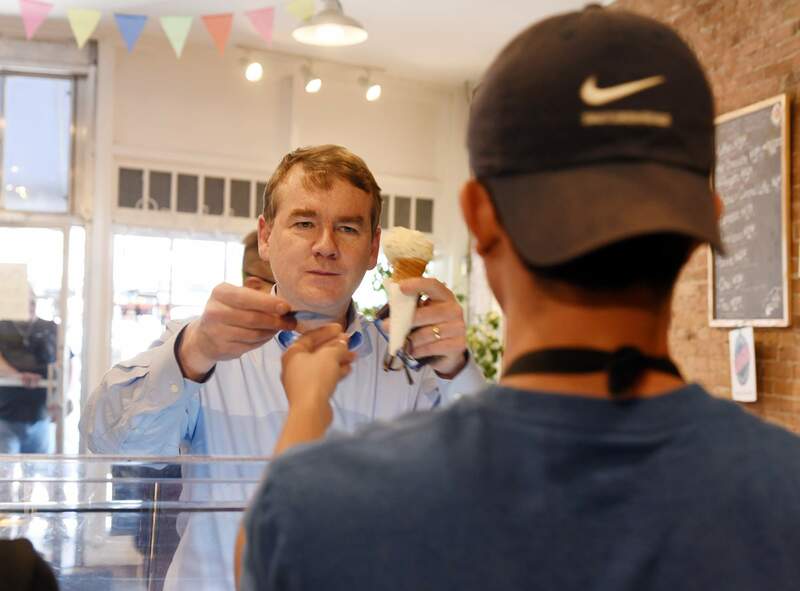 U.S. Sen. Michael Bennet buys a scoop of ice cream from Anthony McKenna at Cream Bean Berry on Main Avenue in Durango on Friday. Sen. Michael Bennet shares a laugh with Cream Bean Berry owner Katie Burford during a visit Friday to downtown Durango. Bennet joined Sen. Cory Gardner, Gov. John Hickenlooper and Rep. Scott Tipton for the trip to meet with government officials and business owners from Durango and Silverton about the economic impact of the 416 Fire. 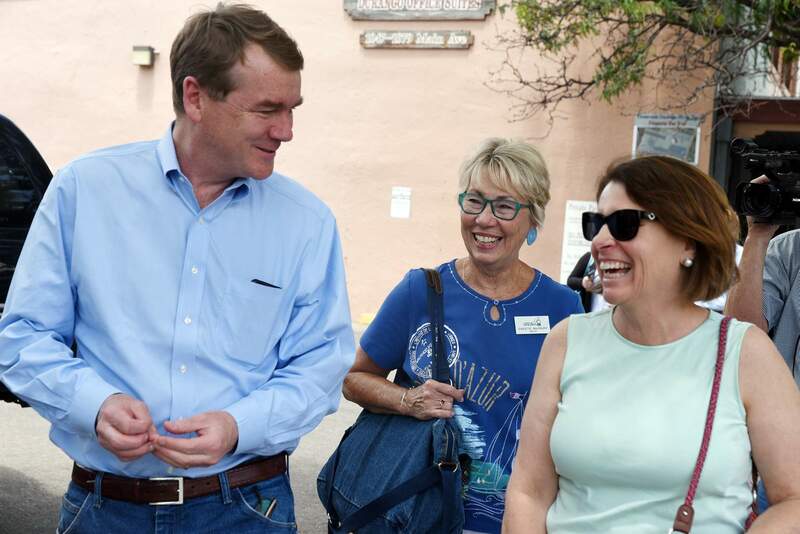 Sen. Michael Bennet, left, chats with Durango resident Jennifer J. Goodwin, right, about water conservation during a tour of downtown Durango led by Durango Mayor Sweetie Marbury on Friday. Bennet joined Sen. Cory Gardner, Gov. 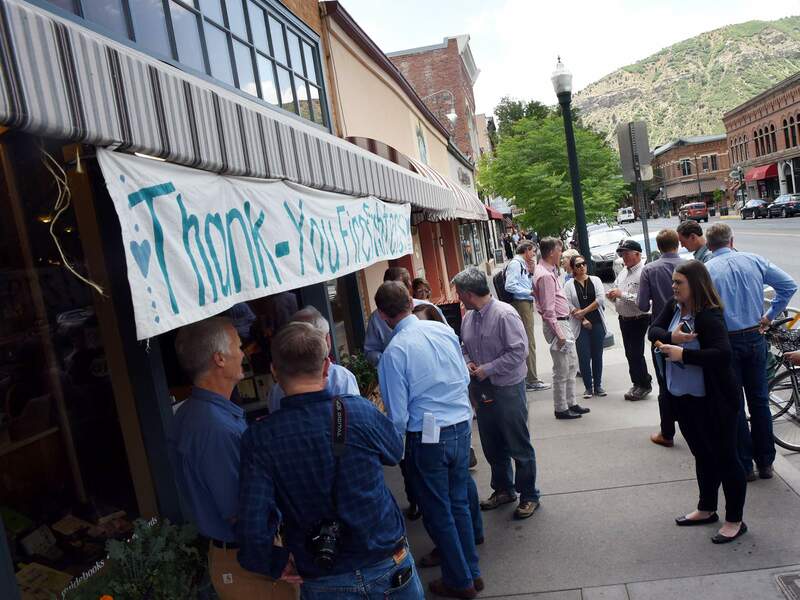 John Hickenlooper and Rep. Scott Tipton for the trip to meet with government officials and business owners from Durango and Silverton about the economic impact of the 416 Fire. Gov. 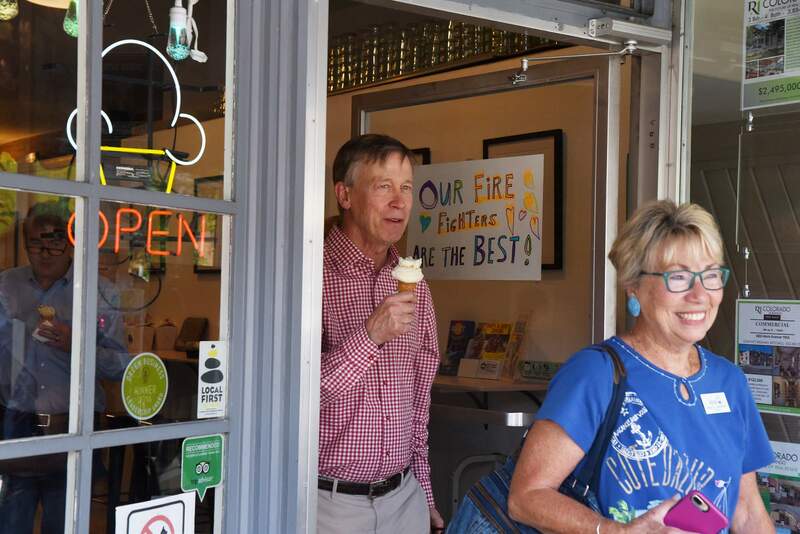 John Hickenlooper leaves Cream Bean Berry during a short tour Friday around downtown Durango to send a message to tourists that Durango is open for business despite the 416 Fire. Durango Mayor Sweetie Marbury escorted Hickenlooper, Sens. Michael Bennet and Cory Gardner and Rep. Scott Tipton during their visit. Walt Dear, left, chats with Gov. 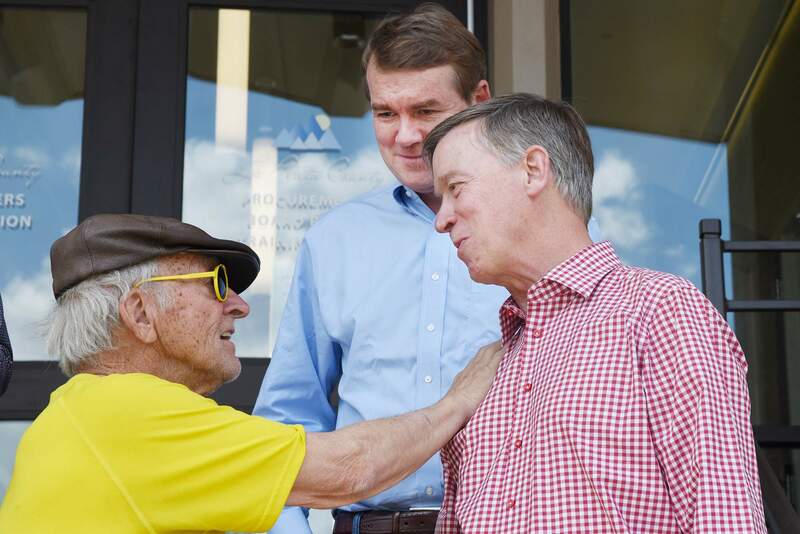 John Hickenlooper, right, and Sen. Michael Bennet during a visit to Durango on Friday. Gov. John Hickenlooper, Sen. Michael Bennet, Sen. Cory Gardner and Rep. Scott Tipton talk with residents outside of Maria’s Bookshop during a visit to Durango on Friday to meet with local leaders about how the 416 Fire is affecting the economies of Durango and Silverton. Local government and business officials pleaded with Gov. John Hickenlooper and Colorado congressmen Friday to do everything they can to help secure emergency funds to help ailing businesses and people who have lost their jobs since the 416 Fire broke out two weeks ago. Hickenlooper, along with Sens. Michael Bennet and Cory Gardner and Rep. Scott Tipton, visited Durango to hear about the economic impacts of the fire here and in Silverton. The fire had burned 32,959 acres as of Friday morning. The Durango & Silverton Narrow Gauge Railroad has suspended service, the entire San Juan National Forest has closed during peak tourist season and other government agencies have cut off public access to open spaces – all to prevent another wildfire during an exceptional drought. Scott Fetchenheir, a San Juan County commissioner, said business at his store, Fetch’s Mining & Mercantile on Greene Street, is down 50 to 70 percent from a normal year. Businesses on Blair Street, off the main drag, have reported business is down at least 90 percent or more, he said. Silverton businesses have not only had to deal with the shutting down of the train, which brings thousands of visitors, but also the closure of U.S. Highway 550, one of only two roads that lead to the town about 50 miles north of Durango. Some Silverton businesses and backcountry trails are open, but there has been a “tsunami” of cancellations because of the fire, said DeAnne Gallegos, director of the Silverton Area Chamber of Commerce. Paul Eckenrode, Vallecito Lake Chamber of Commerce president, said Vallecito Lake has 16 boats available for rent, and during a normal June, every boat would be rented out. On Friday, he said only two rental boats were out on the lake. Eckenrode, too, stressed Vallecito Lake and its handful of restaurants and recreational opportunities are open. La Plata County Manager Joanne Spina said the entire region is struggling financially. “The economic impacts of this go far beyond the tourism industry,” she said. Roger Zalneraitis, executive director of the La Plata Economic Development Alliance, said he has been researching options, such as emergency funding, tax credits and grants to help alleviate the financial toll. He said businesses and employees need help through funding and loan programs that won’t put them in a place where they build debt. Bennet, Gardner and Tipton all pledged their support on the federal level. Along with Hickenlooper, the elected officials said they would look for ways to help. “What we can do to be helpful, you can count on,” Tipton said. 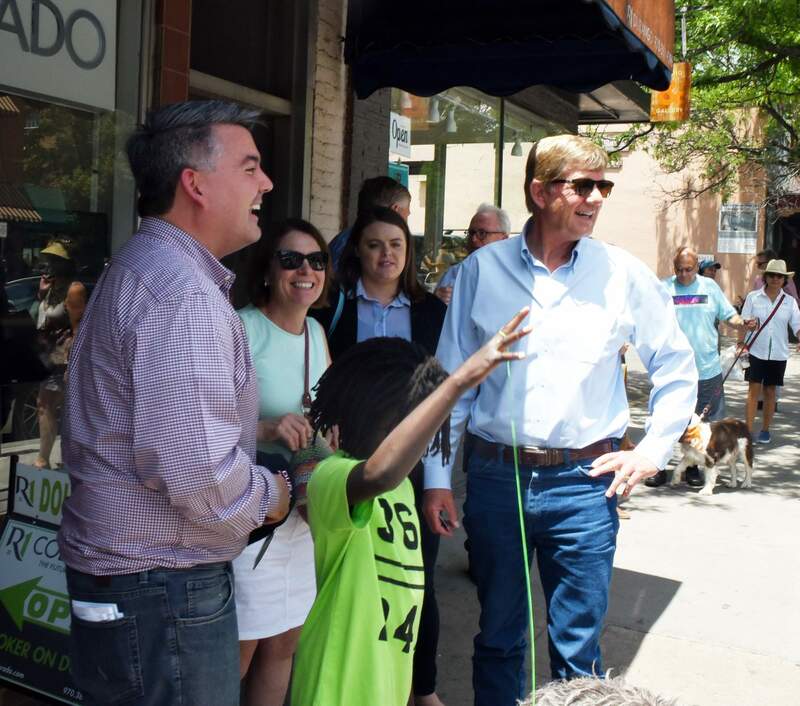 After the meeting, an entourage led by Hickenlooper, Bennet, Gardner and Tipton walked down Durango’s Main Avenue, making stops at local favorites Cream Bean Berry and Maria’s Bookshop, in an effort to send the message Southwest Colorado is open for business.